We’d love your help. 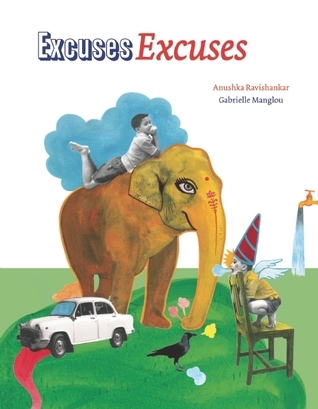 Let us know what’s wrong with this preview of Excuses Excuses by Anushka Ravishankar. White Ravens 2013 Award Winner. "Art and text – intertwined with balanced whimsy – imbue Neel’s tall tales with colorful energy and unlimited creativity." - BookDragon, Smithsonian Asian Pacific America White Ravens 2013 Award Winner. Who doesn’t know a child who is always ready with an implausible excuse when caught out by an indignant adult? Excuses Excuses builds on this universal experience using an Indian setting. Young Neel is the boy next door who can’t help getting into trouble, and yet he is endearing in his explanations. He has one for every day of the week and for every kind of adult — it seems that he may never run out of them! Wildly funny and imaginative, this narrative in nonsense verse is fast-paced and keeps young readers guessing. Unusual and dramatic art that captures the improbable colors of India adds zest to a story that all children would want to be a part of. To ask other readers questions about Excuses Excuses, please sign up. The stories Neel tells as excuse for his departure from intentions are as colorful as Gabrielle Manglou’s illustrations. Neel finds himself at an end of a week’s worth of excuses with the optimism that the next week is a new one; only instead of hoping he will be good and do as he says, we look forward to what excuses he’ll come up with next. Realist images are abstracted in mixed-media collage reflect Anushka Ravishankar’s text wherein Neel’s fancy is pieced among the familiar. Both Ravishankar The stories Neel tells as excuse for his departure from intentions are as colorful as Gabrielle Manglou’s illustrations. Neel finds himself at an end of a week’s worth of excuses with the optimism that the next week is a new one; only instead of hoping he will be good and do as he says, we look forward to what excuses he’ll come up with next. Realist images are abstracted in mixed-media collage reflect Anushka Ravishankar’s text wherein Neel’s fancy is pieced among the familiar. Both Ravishankar and Manglou prove themselves poets, entertaining and smart. Recommended for fans of Judith Voigt and Shel Silverstein. ….would’ve loved to write similarly creative excuses w/ Natalya, but more than that, the illustrations are inspiring. I loved this book of outlandish excuses for everyday of the week. It reminds me of a child I know. Anushka Ravishankar, a mathematics graduate, has made a name for herself internationally as an Indian children’s writer, with over 10 books of verse, fiction and non-fiction. Her special talent is in the area of nonsense verse, where she brilliantly adapts this difficult genre to Indian English usage, without a false note. Anushka Ravishankar can be said to have pioneered the Indian English nonsen Anushka Ravishankar, a mathematics graduate, has made a name for herself internationally as an Indian children’s writer, with over 10 books of verse, fiction and non-fiction. Her special talent is in the area of nonsense verse, where she brilliantly adapts this difficult genre to Indian English usage, without a false note. Anushka Ravishankar can be said to have pioneered the Indian English nonsense verse form and brought it to international attention. She recently returned from a UK tour with Children’s Laureate, Michael Rosen, at the Children’s Bookshow.